(VEN) - Two excellent works with high applicability and great economic efficiency won the Tran Dai Nghia Award during the first award ceremony, which was held recently in celebration of the 103th birthday anniversary of Professor, Academician Tran Dai Nghia. The Vietnam Academy of Science and Technology awarded two works among 15 projects. The first work, which illustrates the process to produce iron and unburned construction materials from red mud by Dr. Vu Duc Loi and Dr. Nguyen Van Tuan has opened up a new direction in addressing and handling toxic mud from alumina production in the Central Highlands in order to turn toxic waste into unburned construction materials. Two alumina plants in the Central Highlands are estimated to discharge about 1.2-1.3 million tonnes of dried red mud each year. Testing production results following industrial scale show that every 2.4 tonnes of dried red mud will produce one tonne of iron ore, while slag samples will be used to produce unburned construction materials. The second work applies advanced technology to produce vaccines for the prevention of diseases in humans by Prof. Dr. Hoang Thuy Nguyen and late Prof. Dr. Dang Duc Trach from the National Institute of Hygiene and Epidemiology. The results are applied in vaccine products used in the expanded program on immunization, especially for children, contributing to avoiding sequelae, severe disability and diseases caused by viruses. The Tran Dai Nghia Award aims to encourage and honor scientists with the most outstanding achievements of natural science and technology, which are directly applied by themselves and contribute to the country’s socioeconomic development and national security. Deputy Prime Minister Vu Duc Dam said that science and technology must be more powerful to create engine for the development of the country, of which scientists must be the main factor. The Tran Dai Nghia Award not only honors scientists and their works but also encourages young scientists to continue devoting themselves to scientific works. 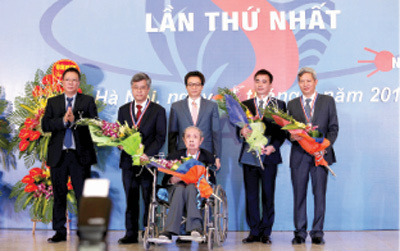 The Tran Dai Nghia Award will be given annually for a maximum three scientific works in the fields of mathematics, computer and information science, mechanics, physics, chemistry, life sciences, earth and environment. Each prize will be valued at VND200 million. Prof. Tran Dai Nghia was a big name in the field of weapon manufacturing in Vietnam, associated with famous products in the history of the war of resistance of Vietnamese people such as bazoka bullets, SKZ guns or flying bombs. He studied in France in 1935 and returned home to join the resistance in 1946.